Dual VET is a field in which responses to the challenges created by technological, economic and societal developments need to be identified on an ongoing basis. Dialogue between the areas of VET policy, research and practice forms an important foundation for this process. The aim of the dual VET topic radar is to support this dialogue by mapping the perspectives towards VET adopted by various stakeholders and making these accessible for the specialist debate. This article describes the development of this instrument, sets out sample results from the most recent survey wave and concludes by outlining prospects for the advancement of the topic radar. In order to be sustainable, dual VET* needs to keep pace with the developments that are taking place in the economy, in technology and in society. Which routes should be followed, and which approaches should be pursued? One of the distinct tasks of VET stakeholders is to find answers to these questions that are viable and likely to lead to consensus. This is a remit which cannot be mastered without dialogue. Broad-based solutions can only be developed by exploring existing views via a process of networking between the areas of VET policy, academic research and practice. The dual VET topic radar aims to contribute to this dialogue by providing a platform on which VET experts are regularly able to present their positions regarding the relevance of various issues to the further development of dual VET. The objective is to describe current opinions and mood changes and make these available for the debate. The basis for this is provided by regular online surveys using BIBB’s “VET Expert Monitor” system. The topic radar was implemented into this system as a stand-alone element at the beginning of 2017. As the Expert Monitor panel encompasses VET specialists from precisely those fields of activity that are of relevance to the topic radar, no new sample needed to be generated. In specific terms, this panel currently comprises almost 1,900 persons who have professional dealings with issues relating to VET in a range of institutional contexts. They may be involved in training, instruction, teaching, administration, research, development or policy making. Most of the VET experts making up the panel were acquired via a quota plan aligned to institutional affiliation. The purpose of this approach is to ensure appropriate representation for the various groups of stakeholders involved in VET, including companies, vocational schools, trade unions, employer associations and research. It is also possible for persons to register themselves for the panel. In such cases, however, acceptance takes place on the basis of aspects such as the profile data supplied at the time of registration rather than automatically. Nevertheless, the institutionally mixed composition of the panel should not be equated with representativity. This could only be achieved via a random selection from the entirety of VET experts in Germany, a group which is unknown. This restriction is set off by the particular strength the panel is able to show in using this institutional approach as a vehicle to uncover differences and commonalities in the opinions of various stakeholder groups (cf. e.g. FRIELING/ULRICH 2013). The opinions on dual VET obtained by the topic radar relate to a selection of issues which have the potential to meet existing challenges. An initial catalogue of twelve topics was compiled and structured using discussion and working papers and on the basis of meetings with experts from BIBB and some of its partner institutions (cf. EBBINGHAUS/GEI 2017). This catalogue served to launch the instrument to the VET specialists on the Expert Monitor panel in the spring of 2017. Preparations for an expansion of the topic catalogue took place at the same time as the first survey. In line with the idea that the objective of the topic radar should be to foster dialogue and participation, respondents were invited to state issues that they deemed to be relevant so that these could be added to the instrument. One of the thoughts behind this procedure was to take as broad a spectrum of topics as possible into account. A second intention was to give respondents an opportunity to find out about the position adopted by other experts towards topics they themselves deemed to be important rather than simply allowing a view to be expressed on pre-defined issues. The initial investigation has thus far been succeeded by two further surveys using an expanded topic catalogue (cf. Table 1). The instrument was very well received. Participation was high (cf. Table 1), and 85 respondents stated topics which they considered to be relevant. Some respondents contributed a single topic whilst others put forward several issues. The result was that a total far in excess of 100 topic proposals were submitted. Whereas some of these suggestions drew upon or further specified topics already included in the catalogue, others addressed other issues and contents. These were then set out in structured form. Subsequent selection was guided by the frequency with which individual topics were mentioned and by the facets of dual VET they addressed. It was, for example, ensured that content-related topics were taken into account and structural themes were selected. Ultimately, however, there was also a focus on according consideration to the economy of the survey itself. For this reason, the decision was made only to add six topics to the catalogue for the time being. The topics introduced were formulated in highly different styles, including as questions, problems, challenges, concepts or ideas for initiatives. Adaptations were made by formulating these issues in a standardised way as approaches towards the further development of dual VET, just like the topics already contained within the catalogue. One exception in this regard is represented by the topic “Digitalisation of the world of work”, which is formulated as a hybrid between a trend and an approach. 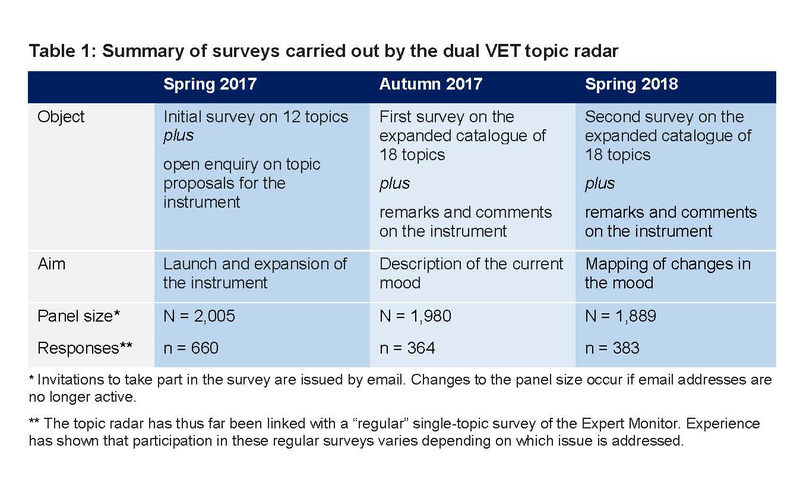 Nevertheless, the designation of the instrument as the dual VET topic radar – as introduced in the initial survey – was retained. The catalogue now encompasses 18 topics, including six which were incorporated as the result of proposals made by respondents (these are marked with a * in Table 2). Finally, the topics were structured in accordance with five thematic areas (cf. Table 2). Two assessments are obtained for each of the 18 topics in order to depict the prevailing mood regarding the relevance of the approaches in terms of moving towards sustainable dual VET. One of these assessments relates to the importance the topic is currently deemed to have within the VET discourse, whilst the other focuses on the relative significance that should be accorded to the issue. Both of these evaluations can be carried out by using a five-stage scale. In the case of the importance the topic is currently perceived as having, the categorisations are “high”, “quite high”, “medium”, “quite low” and “low”. In terms of preferred significance to be given to the issue in question, the steps used are “much higher”, “higher”, “same”, “lower” and “much lower”. When these two evaluations are compared, it is possible to recognise whether respondents believe that a topic is appropriately localised within the VET debate. Another aspect that becomes clear is the nature of the basis from which the case is argued for the topic to be allocated the same or a different degree of importance for the further development of VET. In other words, if a topic is already considered to be of “high” importance, the vote that this significance should remain the “same” takes on a different meaning as compared to an issue which is currently assessed as being of “low” importance. Projection of the evaluations onto a coordinate cross provides a simple and easily comprehensible way of working out the differences and commonalities in the opinions expressed by various stakeholder groups. Such a graphic also creates visibility in terms of which current perception serves as the foundation for adopting a certain position on the desired significance that should be allocated to a topic. The Figure shows this information using the third wave of the survey, conducted in the spring of 2018, as an example. 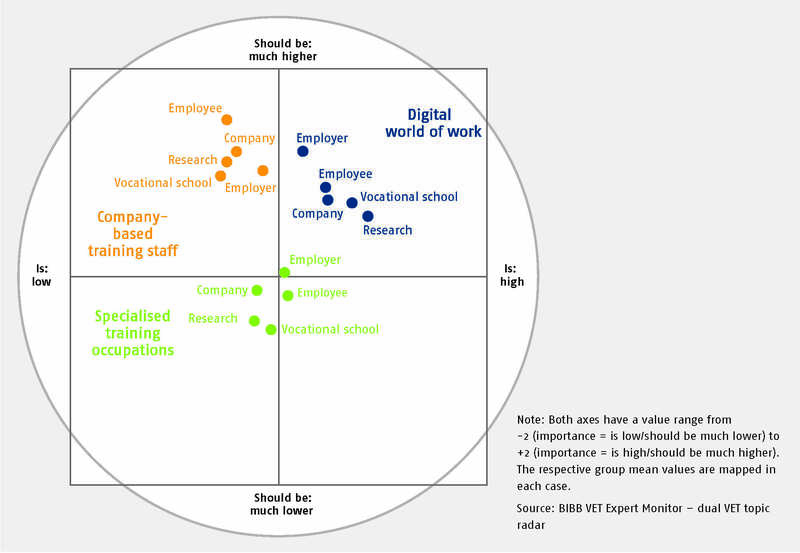 Comparisons are drawn between the assessments made by stakeholders from practice (companies and vocational schools), evaluations of policy stakeholders (trade unions and employer associations) and research relating to the topics of “Strengthening of the position of company-based training staff”, “Digitalisation of the world of work” and “Development of more highly specialised training occupations”. The mean assessments relating to the current importance of the three topics in terms of the further development of dual VET are mapped along the abscissa (x-axis). The values shown on the ordinate (y-axis) represent mean evaluations of the significance which ought to be accorded to the topic as compared to the status quo. 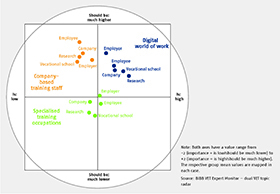 The first thing that stands out is that the individual stakeholder groups take a highly similar view of the three topics to the extent that their assessments each display the same basic tendency. Digitalisation of the world of work, for example, is seen as a topic which is already attracting a considerable degree of attention but is also perceived as being an issue on which an even greater focus should be placed in the further development of VET. By way of contrast, strengthening the position of company-based training staff is viewed as having less presence within the scope of the VET debate. However, all five stakeholder groups agree that this does not do justice to the relevance of this issue. All groups also make the case that more attention should be paid to the needs of company-based trainers. 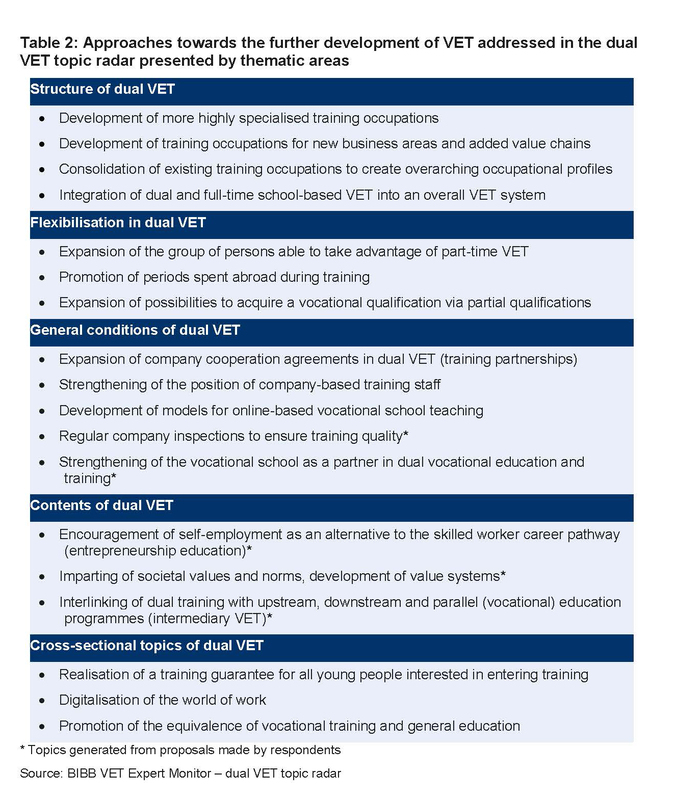 Finally, the development of more highly specialised training occupations is seen as an approach which is receiving moderate attention with regard to the future shaping of dual VET. The respondents more or less believe this categorisation to be appropriate. A second glance, however, also makes it clear that the individual stakeholder groups occupy these fundamental positions with differing degrees of emphasis. Employer representatives are more insistent than representatives of the other groups considered here that more commitment must be shown than hitherto with regard to addressing the developments and changes in dual VET that are emerging in the wake of digitalisation. Compared to the other groups, employee representatives are more vehement in arguing that issues such as the status of trainers at companies are currently being neglected and need to be accorded greater attention. 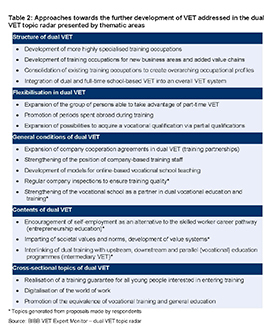 Experts from research and vocational school training practice are most likely to take the view that somewhat more reticence should be exercised than has previously been the case in respect of the development of highly specialised training occupations. 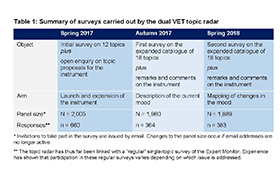 The surveys thus far conducted using the dual VET topic radar indicate that the instrument can serve as a vehicle for providing information on how VET experts perceive the respective current VET discourse and on what topics they are presently prioritising. Repeated surveys using the same topic catalogue also permit recognition of the extent to which moods relating to the individual topics remain stable or are subject to fluctuations. Finally, the instrument appears to offer potential in terms of revealing similarities and differences in the views adopted by individual expert groups on the relevance of topics for the further development of dual vocational education and training. Notwithstanding this, the instrument is not able to supply any explanations of or reasons for the respective results. No statements may be made, for example, regarding the expectations the respondents from the fields of policy, research and practice associate with a stronger position of company-based training staff. It is much more likely that the positions adopted by respondents will be able to act as an impetus for the further consideration of such issues, such as via a more in-depth survey on the topic area. Because of the encouraging nature of the start-up phase, the dual VET topic radar should be established on a broader basis via means such as endeavouring to expand the expert pool invited to take part in the surveys. Secondly, the instrument should undergo further content and conceptual development. The participative approach selected for the initial phase should continue to be pursued in this regard. The VET stakeholders making up the panel should once again be invited to submit proposals to supplement the catalogue or replace individual topics it contains. The extent to which this will lead to a restructuring of the topic catalogue – such as into “trends” relating to developments which produce challenges for dual VET and “approaches” showing possible pathways for the countering of these challenges – remains to be seen. Although this will not remove the restriction of only being able to map a section of topics, the aim of adopting such an approach is to ensure that this section will be a relevant one. In addition to this, the panel members should be afforded the opportunity to help shape the mode and the frequency of the surveys. This will enable information to be gleaned on aspects such as whether the current way in which the topics are evaluated should be further differentiated or entirely redesigned. Topics could, for example, be divided into sets from which respondents would then select the issues they deem to be the most important from their respective point of view. This form of participative further development is tied in with the aim of enhancing the usefulness of the dual VET topic radar for dialogue between VET stakeholders from the fields of academic research, policy and practice. * Dual VET refers exclusively to VET that takes place pursuant to the BBiG [Vocational Training Act] or the HwO [Crafts and Trades Regulation Code].